Hi there, ladies and gents. I hope you are having a fantastic January! It's been a bit quiet around here lately-- between the holidays and being sick on and off for the past few weeks, I've either been gift-knitting like a madwoman or snuggled up in bed, sipping tea (and maybe whining just a little). But I'm excited to get back to blogging. the Christmas Spice tea has little snowflake sprinkles in it-- how cute is that! My brother's girlfriend sent up this delicious tea for Christmas (thank you Sheila!) and I've been having at least three cups of it every day because it's just so tasty. I think the Strawberry Honey is my favorite. I've been getting a lot of knitting done between the inevitable caffeine crashes. 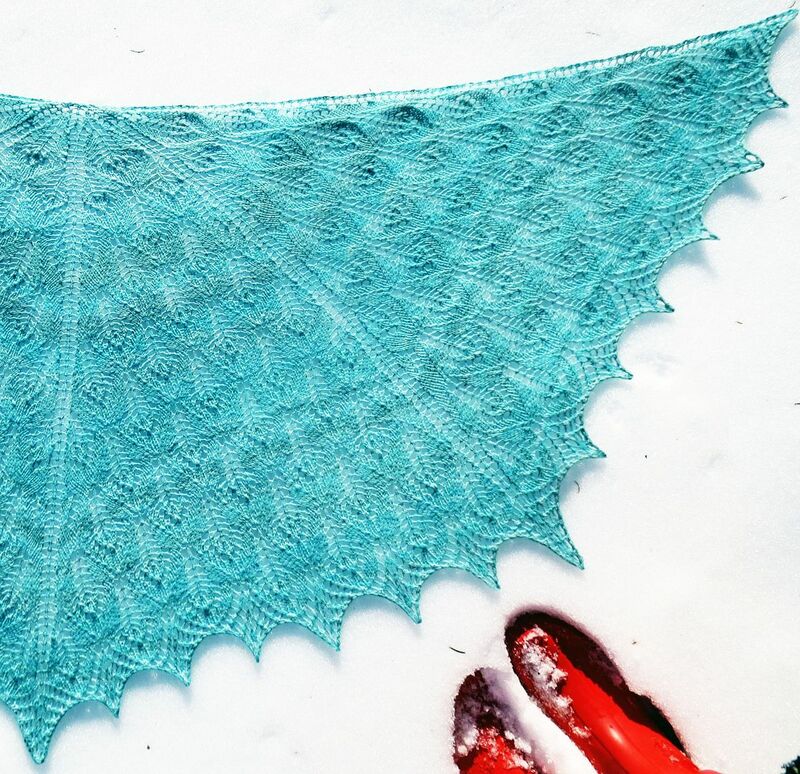 Speaking of which, I finished my Robins' Feathers shawl! I'm pretty excited to have knit my first big lace project. Yay! You'll be seeing more of this shawl soon-- I want to post a photo of myself wearing it because it's huge and I don't really wear shawls draped around my shoulders. It makes a lovely scarf-ish wrap, though. But y'know who needs to see me looking bleary and cold-stricken? Nobody, that's who. So it'll have to wait until I'm no longer sniffly. Anyway, my Robins' Feathers shawl took a couple tries to get going, but now I feel confident in my ability to read complex charts, and I'm already trying to decide on another shawl to cast on. I think it's going to be the Hogwarts Express. I've been spinning up some soft, fawn-brown alpaca for the Pomme de Pin cardigan, but I'm not going to have enough yardage, and I think it'll be a better match for the Hogwarts Express anyway. ...And c'mon, how could I not knit it? It's snuggly and Harry Potter themed. I'm also still knitting away on my busy bee quilt, so I'll show you my progress on that soon, too. I hope you have a wonderful evening! 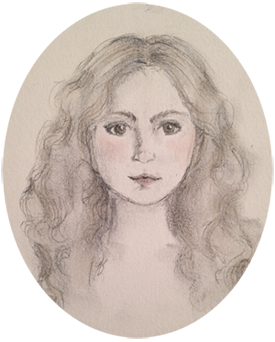 What a creative blog you have Julie! The Strawberry Honey tea sounds excellent! Oh my gosh, it was so good! Now I need to track down some more of it, because I loved it so much. Yum. Thank you for stopping by! Thank you so much! It took a little while to get the hang of it, but by the second chart, it was a really enjoyable knit. And isn't the Hogwarts Express adorable? I'm so excited to knit it-- I just have to finish spinning for it before I cast it on. The shawl is so gorgeous! Well done! I love the look of the tea too! I wish I knew where to get lovely teas like that in the UK. Thank you, Kelsey! I've become accustomed to wearing shawls most days now-- I guess I'd better knit some more of them! Hmmm... maybe check Etsy for tea? I'm sure there are sellers who would ship to the UK. 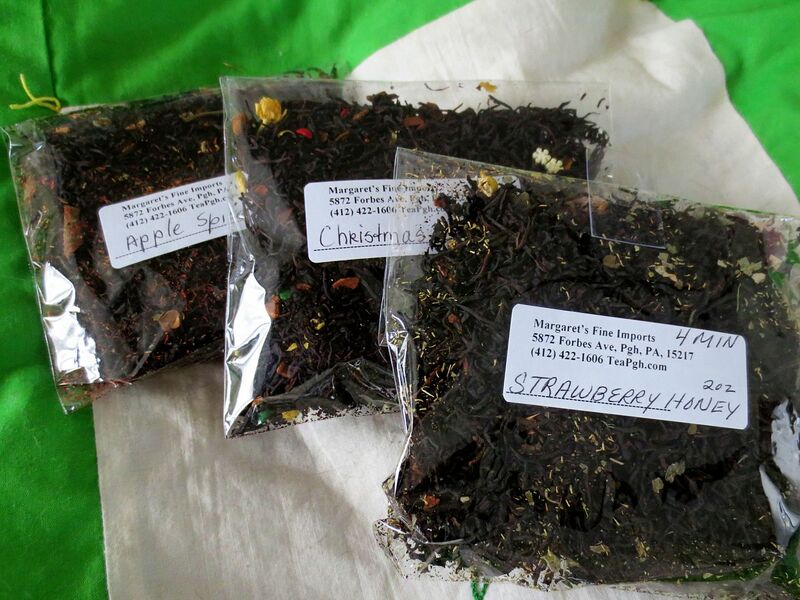 Ha, I've just remembered-- over the summer, I ordered tea from the UK! The novelty tea trend does seem to be going strong over here, though.